Whether you are battling the hoarding compulsion yourself or working with a loved one, you can get help with hoarding. While you are trying to determine where to start, the ServiceMaster of Lincoln Park in Chicago can provide you with guidance and help you feel less overwhelmed and more in control. Don’t try to tackle this project on your own and lose countless weekends and spend your time driving to the dump. Let ServiceMaster Restore assist you with this difficult chore, so you can get help with hoarding and reclaim your happy home. Clutter Cleaning Specialists: When we take on work related to hoarder cleanup in Chicago, we often find clutter is the biggest problem. We specialize in attacking your counters, shelves and open spaces so we can sift through this clutter and make sure it’s removed in a responsible manner. Complete Trash Outs: Sometimes, apartments and homes just need a clean slate. That is, there’s nothing left to salvage. But hoarder junk removal in Chicago can often feel overwhelming for two reasons. First, there’s often a ton of it, and many dealing with these situations don’t know where to start. Second, where do you take the junk once it’s removed? We take care of both problems. Tailored Cleaning Service for Your Particular Needs: You provide the direction and we take care of your specific challenges when you choose ServiceMaster for tailored cleaning services and hoarder cleanup. 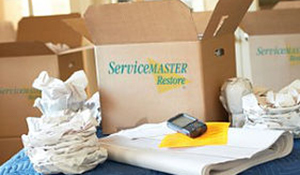 Recovery of Documents, Sentimental Items, Valuables: We understand that not every job is simply hoarder junk removal. Sometimes there are precious items among the junk, and those precious items need to be salvaged. We can help discern between what’s junk and what’s an important document, for example, or identify items that might have sentimental value. Delivery of Storage Bins and Filing Boxes: You need the right materials for proper hoarder cleanup — items like storage bins and filing boxes. We can provide all of the materials needed to get the job done quickly and do it right. Packaging/Transport/Storage of Items: Count on us for full-service hoarder cleanup in Chicago, including the packaging, transport and storage of items that need it. Biohazard Cleaning Including Animal/Human Waste: Sometimes junk and clutter build up because there is animal waste, human waste or other unpleasant waste present in the home. We can take care of both animal and human waste, as well as other biohazard cleaning needs. Roll-off Containers from 3-40 yards: Different jobs require different materials. We can provide roll-off containers in a wide range of sizes that can be used to capture the junk at the home or apartment, then quickly removed once the job is complete. Recovery/Disposal of Medications and Sharps: We can also sift through your clutter and junk to recover medications or dispose of sharps. Appliance recycling: Some large and substantial items can be recycled to maximum benefit — items like appliances. We can remove and recycle appliances of any sort. Donation of Items to Charity of Your Choice: Your junk or clutter can find new life in some cases. We can salvage and donate any items you don’t need that might be of benefit to someone else. Household Hazardous Waste Disposal: Are you dealing with any sort of hazardous waste? These materials require an expert to properly dispose of them. We can be your hazardous waste removal experts. Deep Cleaning after Trash/Clutter Removed: Once we complete our clutter removal, it’s time to go to work deep cleaning the space that was once filled with clutter. We can provide these deep cleaning services that truly return a home back to livable condition. It is worth it to invest in a hoarder cleaning service. When the mountains of clutter are towering and movement in the home is limited, you can trust that cleaning the mess will take longer than you think. Your time is valuable, and when you start calculating how long it will take you to clean the mess without the help of a ServiceMaster of Lincoln Park, it becomes clear that you will benefit from professional assistance. Don’t spend every weekend for the next year struggling through the disaster on your own; call us for help with hoarding to clean the house faster.